People left the Prada show talking about two things. 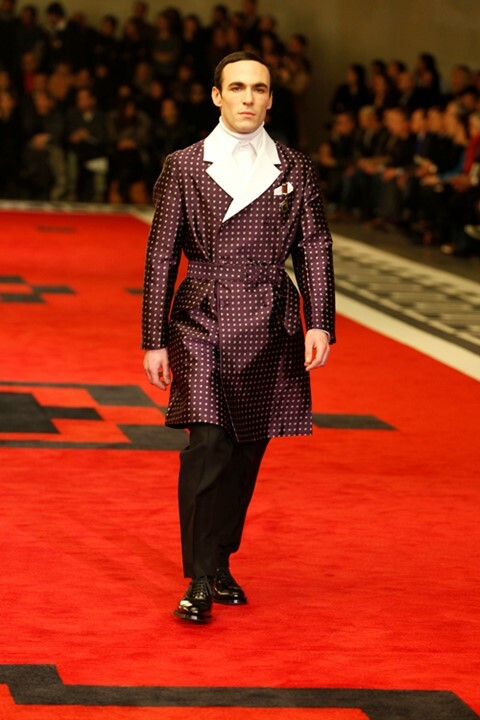 The clothes, of course, but they came second to the amazing cast of actors that Miuccia Prada had managed to score. How on earth did she manage to make them all find a simultaneously free spot in their busy cinematic lives? Let's do the whole long list because they all need to be mentioned: Jamie Bell, Adrien Brody, Alexandre Carril, Victor Carril, Willem Dafoe, Garrett Hedlund, Emile Hirsch, Gary Oldman and Tim Roth. All in one fashion show, all wearing Prada. Magnificent! Set in Prada's usual catwalk laboratory (their set design, by OMA/AMO, is always amazing), the models and actors took to a massive carpet measuring 20x35 metres and coloured in red, white and black. Above them, six chandeliers hung fitted with 300 neon tubes, evoking "the grandeur of a palace". After last season's golf frenzy, there was a much more austere and scaled back mood in the sartorial department, though. Grey, black and white dominated and coats were the Garment of the Season. Underneath the belted coats, white shirts over thin roll necks meant the ensembles felt uniform-like. A few coats were even layered on top of each other, and eventually came out in a few more colourful shades, such as red and mustard yellow, some of them pinstriped. Each coat had brooches and badges on the chest, or sunglasses in the chest pocket. Coats soon gave way to suit jackets, many of them double-breasted. Adrien Brody wore a red coat, Gary Oldman finished the show in an elegant suit, Tim Roth couldn't stop smiling. Top model Clement Chabernaud, though, was left with showing off white boxer-like shorts underneath his coat. This was a surreal Prada show with glamorous stars posing as models wearing a quite strict and scaled back Prada wardrobe.